While there are a number of on-campus groups that support different perspectives on the Israeli-Palestinian conflict, there is not always a great deal of successful communication between them. “Restoring Dignity in the Israel-Palestine Conversation,” a new “third-space” conversation series sponsored by the Tufts University Chaplaincy, aims to open up the dialogue among students. According to the series’ facilitators, the goal is not to give students a specific opinion on the conflict, but to allow them to express their ideas and listen to others in a welcoming space. 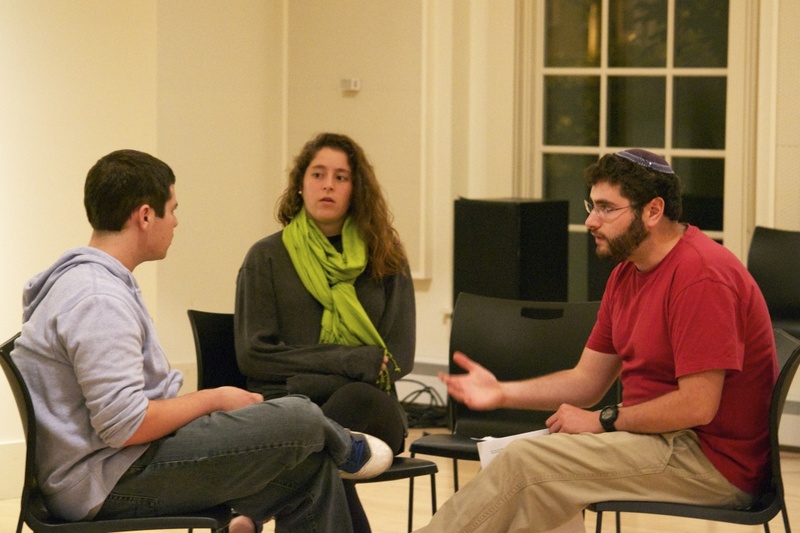 The program, which began on Sept. 16, runs for eight weeks, with participants and the two facilitators convening at the Interfaith Center every Tuesday from 6-8 p.m.
“[The Chaplaincy] thought that students needed a third space for them to express their opinions regarding the Israeli-Palestinian conflict,” Yousef Bashir, one of the facilitators, said. Both of the series’ facilitators worked on promoting peaceful discourse regarding the conflict prior to coming to Tufts. Rebecca Polivy works with Encounter, an organization that aims to bring primarily American-Jewish leaders into face-to-face conversations with Palestineans. She is working as a facilitator alongside Bashir, a Palestinian from Gaza, whom she had previously heard speak. Polivy and Bashir both bring a unique expertise to the series. Bashir, who is currently pursuing his Master’s Degree in conflict and coexistence at Brandeis, has previously spoken at a number of colleges across the United States. Students were selected to participate through an online application process. In the application, they were asked to share what interested them about the conversation series, as well as their religious or philosophical background. “I think there is [a varied representation of opinions] based upon the applications that we got,” Polivy said. Weinberg agreed, stressing the importance of participants whose views are not always represented in other conversations surrounding the issue. According to Weinberg, however, there aren’t very many participants with more extreme viewpoints. “While those voices are present, they’re in smaller numbers,” he said. Weinberg also serves as a board member of the Tufts chapter of J Street U, an organization that advocates for American leadership in bringing about a two-state solution. Weinberg decided to get involved with the series per Summit’s suggestion. The series intends to provide a space for students to comfortably discuss the conflict, as well as listen to opposing viewpoints. In addition to providing a place for conversation, the facilitators are also aiming to promote listening skills. “The first [meeting] was really about setting our communication guidelines and practicing what it means to really listen,” Polivy said. According to Polivy, since there are close to 30 students attending the meetings, they split them up into small discussion groups. “[The series] is very much based on the small group model … up to five [per group] at the most is our goal,” Polivy said. According to Bashir, the students previously participated in name games and listening exercises during the meetings. In one meeting, they participated in an activity where they were given a statement and had to position themselves on a spectrum based on whether they agreed or disagreed with the statement. “It’s pretty interesting to see [people] from the same identity have different approaches to the same idea,” Bashir said. According to the chaplaincy website, the series will also include films, lectures and team-building activities. Bashir hopes that students will continue to use the tools for listening and communication that they have learned even after the series is over. “I hope that they think hard before they give up, and always expect that it’s going to be challenging … to ask questions and learn about others,” he said. The lessons learned in the series are something that participants can carry with them into other clubs and student groups. “I think that my work on campus is only going to be lifted up through this experience,” Weinberg said.